April Fools' day is upon us, and just like every other year, the majority of tech companies and their marketing teams did their best to troll us in the spirit of the holiday. Some succeeded and laughs were shared, but others failed miserably and raised cringy smiles. This year, most couldn't hold up until April 1 and released their best troll efforts on March 31. Well, we are not complaining at all, as we are always down for a good laugh. This year, we are pleasantly surprised by the quality of the jokes that are hitting us left and right — some of these certainly took a lot of thought and preparation. One of our favorite CEOs also took part in April Fools' 2016, and we are more than glad he did! Check out our top picks of April Fools' jokes and gags right below. Your ASUS ZenFone Max can charge a Tesla! 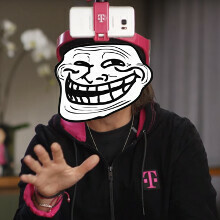 Do you know what's better than T-Mo's Binge On streaming service? That's right, real life! One of Google's April Fools' jokes involved a secondary 'Send' button in Gmail that allowed you to reply to a conversation with Gmail's new Mic Drop reply feature, which sends an appropriate Minion-inspired GIF and mutes the thread. Sounds lighthearted, but it led to a huge backlash from users who complained that Gmail's April Fools' day joke has had dire consequences on their communcation. As many were using the button without knowing what it does, important conversations got muted, and allegedly, at least one person has lost their job. Ouch! Got an ASUS ZenFone Max? Got a Tesla? If yes, did you know that you can charge your car with the humongous battery of the phone? Neither did we. With the brand-new ASUS Charge Tesla adapter, you totally can, or this is what ASUS tried to convince us all. Ever since the OnePlus One, OnePlus has had a soft spot for sandstone-clad things. Apart from two of its phones, it also used the material to make an iPhone case. It seems the initiative is not going to die out, as OnePlus just unveiled a whole new range of sandstone products, including mugs, soaps, and sneakers. "Quiet, reliable, gentle, they are the perfect marriage of form and function!" Although drones are the new craze in the product delivery business, Google feels like it has a technology more fit to deliver packages to consumers. All, meet Parachutes by Google Express! Are you a fledgling ghostbuster making their baby steps on the scene? If so, Sony's got you covered... totally not in slime! It introduced the Proton Pack ghost-catcher which comes with a hydrogen plasma cell and a synchrotron. A whatnow? There is one thing better than virtual reality. And it's called... drumroll, please... actual reality! With Google's new plastic see-through VR headset, you can easily jump on the latest tech craze. Trousers remain one of the largely unexplored areas of nowadays' tech companies and it seems Samsung wants to be a pioneer in this niche. Introducing the Internet of Trousers, Sammy really wants to step up the game with Wi-Fly, Get Up! Alert, Fridge Lock, and Keep-Your-Pants-On mode. It seems that some Google researchers have discovered the reason behind dark matter and wormholes. The answer is logical and way MEOW more unusual that you might think! Plain emails are boring. There's no second opinion. How can one spice things up? The team behind Google's Inbox has got the answer - smart emojis! Inbox' Smart Reply just learned a new trick: the ability to suggest emoji instead of plain text. The Google Parachute one actually looked real for a bit. Haha! Nice to see some tech-humour! The Android YouTube app still won't allow comments to be posted, so if that's not an April fools joke they need to get on fixing it. If it wasn't for the "Sandstoned Soap", I would've fallen for the joke that OnePlus did.